Tay Ninh (VNA) – The People’s Committee of southwestern Tay Ninh province has proposed the Ministry of Industry and Trade add 15 solar power projects to the provincial planning scheme on electricity development from 2011-2015, with a vision through 2020. According to the committee, since June 2017, enterprises have asked for the province’s permissions to build 15 solar power plants, worth a total of 15.4 trillion VND (678.4 million USD). The projects have a designed combined capacity of 554 MW and will be implemented from 2017-2019. 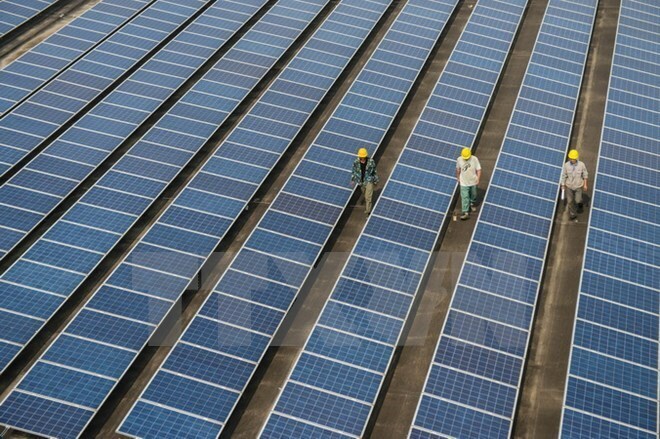 The Mien Trung Energy Joint Stock Company wants to invest over 1.3 trillion VND (57.2 million USD) in a 50 MW solar power plant on 60 hectares around Dau Tieng lake in Tan Chau district, while the Bien Hoa-Thanh Long One-Member Co. Ltd. plans to build a 30 MW solar power plant, worth 736 billion VND (32.38 million USD) on 37 hectares in Thanh Long commune, Chau Thanh district. The TTC Green Energy Company registered to use over 110 hectares in An Hoa commune, Trang Bang district, to build two solar power plants, with a combined capacity of 94 MW, worth over 2.43 trillion VND (106.92 million USD). The Asia Polytechnic Company also wants to use 120 hectares in Dau Tieng lake to build two solar power plants with a combined capacity of 60 MW, worth over 1.5 trillion VND (66 million USD). Nguyen Thanh Ngoc, Vice Chairman of the provincial People’s Committee, said Tay Ninh has huge potentials for solar power development, with the solar radiation reaching 5.1kWh/square metre per day, and the average sunshine duration of 2,400 hours per year.